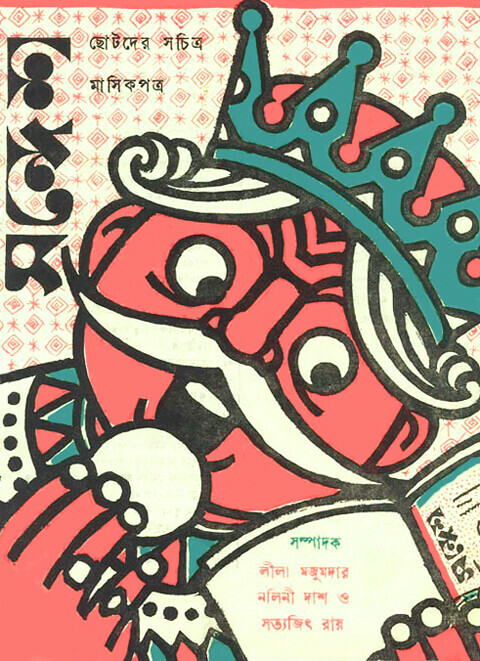 Sandesh (the magazine) & its delightful covers have been a part of my childhood. The covers and the fine illustrations have also in various ways shaped my graphic sensibilities. 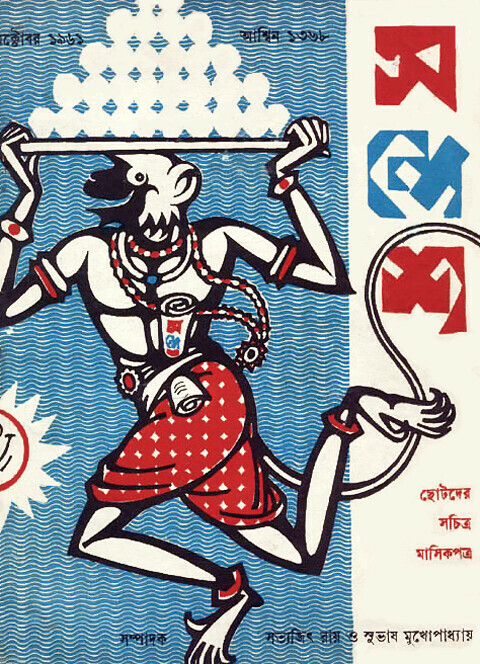 Some of the iconic designs for Sandesh by Satyajit Ray will remain the finest examples of graphic art produced in Bengal. So when I had the opportunity to design a cover for the magazine’s latest edition, I knew it was going to be a homage to the ideas and impressions that I generally associate with the magazine. I had in mind the simple 3-color (sometimes 4-color) designs by Ray. Sandesh covers, for me, have always been about a very simple brand of humor & that famous Sandesh smile – that toothy grin of surprise & innocence. Also, the pair of mascots (the boy and the girl), and that pot of sandesh (the sweet, which returns from time to time as a visual clue) had to be there. 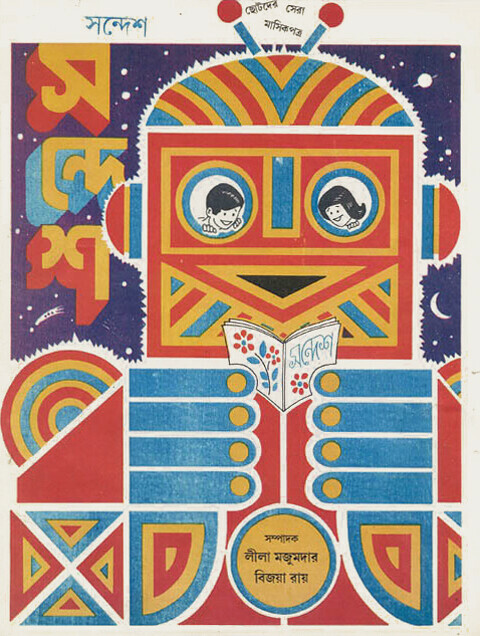 There was always going to be a reference to printing, as Upendrakishore’s pioneering printing house U Ray & Sons (where the first Sandesh was printed) comes to mind, along with Satyajit’s science fiction fantasies with a youthful intermingling of diverse scientific technologies. I also remember the illustrations of W Heath Robinson, the British cartoonist, whose elaborate drawings of fantastic contraptions were always a special attraction of Sandesh. I knew I had to bring all these elements together to sum up what Sandesh meant to me. Since Sandesh never had a fixed logo, or a masthead, designing a cover art meant an integrated lettering – each Sandesh cover has a unique masthead. What I have published above is the artwork I had left at 1/1 Bishop Lefroy Road a couple of months ago. I understand some additions & modifications are inevitable when the in-house design team attempts to fit the artwork in their current scheme. 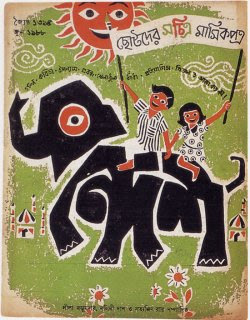 Here, I leave you with a few of my favorite Sandesh covers by Satyajit Ray. Some of these covers have been printed in rotation, and as a result many issues bear the same cover art, with minor changes in color. 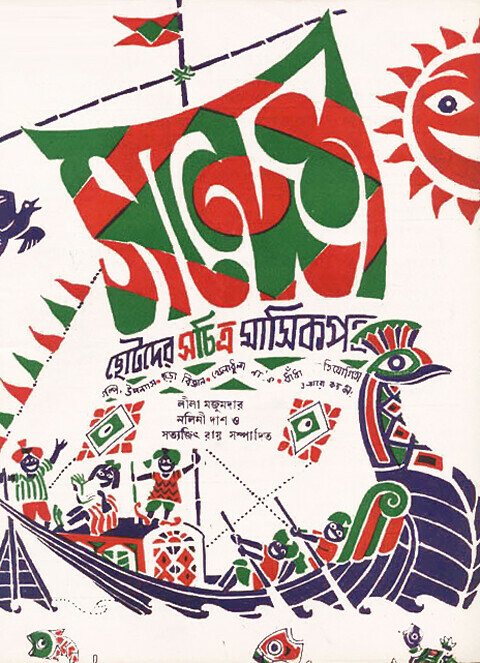 The peacock-ship is a recurring motif in Bengali fairy tales, where kings and merchants traveled to distant seas in the search of fortunes. I love the stylized lettering in the shape of a sail, maybe a visual pun with the word ‘masthead’, and the overall design is masterly. The crow probably suggests that land is near. I love the simple humor of this piece, the composition, the expression of the pahalwan, and his hairdo, which echoes his mustache. My favorite, the happy space-robot and its happy pair of eyes. Everything about this design works – the colors, the shapes, and the electric radiation of happiness in the form of a jagged contour. But best of all, the tiny Sandesh in the large pair of mechanical hands creates a strange sense of a very endearing disparity. From the childlike king in Goopy Gyne Bagha Byne, to the literary-minded ruler of Lucknow in Satranj Ke Khiladi, to this one here who indulges in both kinds of Sandesh, the sweet & the magazine, oblivious to the affairs of the state. 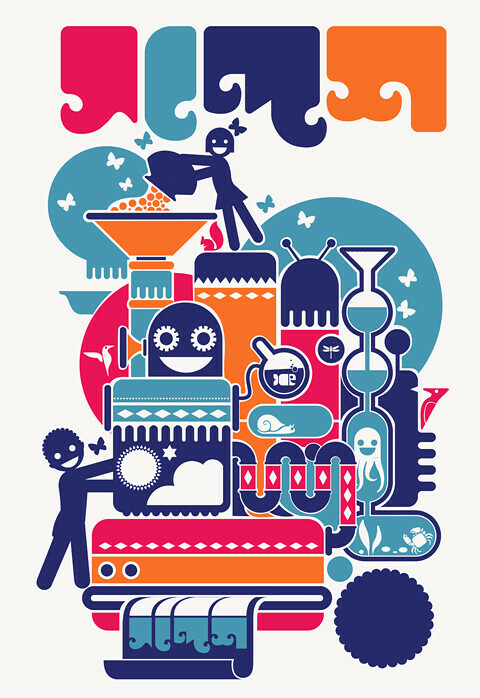 I love the figure of the ringmaster here & how he is graphically constructed with simple shapes. 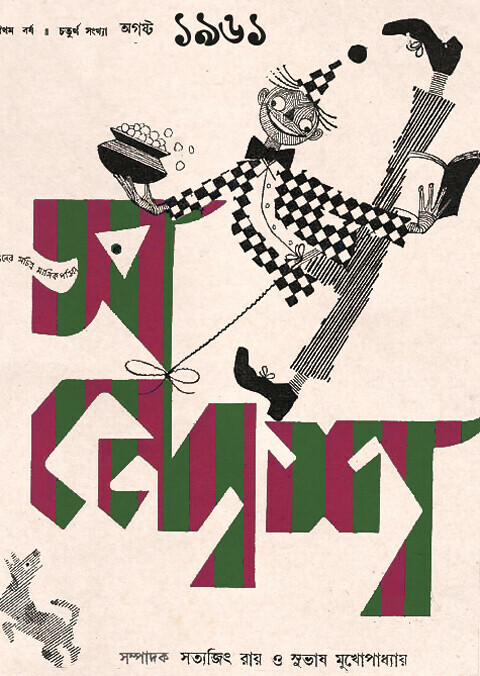 The one below, visibly different from the rest of the designs, is the first Sandesh cover designed by Ray, when he revived the magazine in 1961. Another early design, first appearing in 1961. The classic Sandesh-style is in formation here. The theme is clear, it fuses two Hanuman stories into one: the image plays on the myth of the monkey-warrior carrying the mountain, but here, it’s a mountain of sandesh (the sweet); but Hanuman is also the ‘original’ messenger of Indian mythologies, who carried Rama’s message (sandesha, in Sanskrit) across the sea. 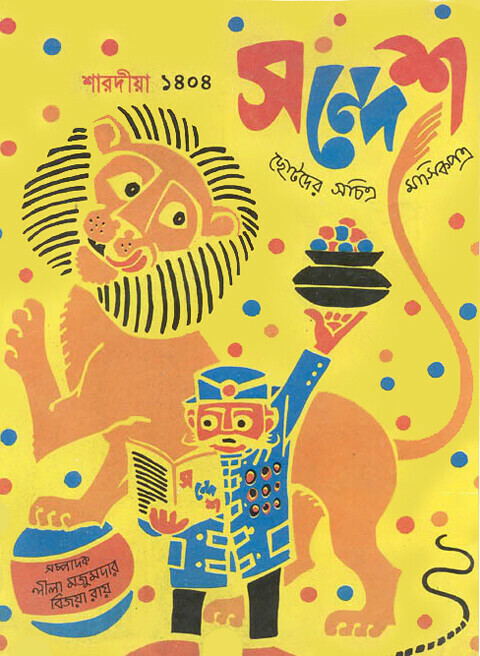 The magazine was first started in 1913 by Upendrakishore Ray, who called it Sandesh to imply the nature of the magazine, which was informative and entertaining, as Sandesh in Bengali is both news and a type of sweet. Upendrakishore edited it till his death in 1915, when his illustrious son Sukumar took over. Upon Sukumar’s death in 1923, his brother Subinoy continued the publication till 1934, when the magazine closed down. Satyajit revived it after a gap of 27 years. This year is the 50th anniversary of the revival. I loved all of them, there's lso one with the word Sandesh written like an elephant. u must have seen that? the 1st one is by you? here's a good link to the cover I mentioned. Thanks a lot for commenting! Yes, the Sandesh in the shape of an elephant is a very famous one, and most covers by Satyajit are brilliant, needless to say. I discussed just a few because they are my personal favorites :) But could go on about every Sandesh cover...Maybe in another post? Thanks again for the link! this is really wonderful! am sharing this on fb! Am late to the party, but had a feast of sandesh, nonetheless! Thank you, Shubho for this wonderfully educative post. I will follow Manish and share this on FB. Three years ago, Sandip Ray requested me to translate into English Pagla Dashu and I also volunteered to translate some of my most favorite stories published in Sandesh over the years. I have translated just a few; I wish I could do more. Is it possible that someone could do a project to publish a special issue on Sandesh's 100th anniversary in 1913 (and perhaps a mini-version overview in 2012 on the 50th year of its revival)? It would be a worthwhile project; Sandip had mentioned about them too. I'm willing to contribute my translations for free so that our Bengali-handicapped next generation as well as non-Bengali and Western readers can appreciate the contribution of this magazine to world literature. Please let me know. Again, thank you very much. This is great! @Partha - Thanks a lot :) Sounds very interesting! In my excitement, I forgot to compliment you, Shubho. Your cover design is terrific--so well integrated and conceived. i have no words, revisited your blog after a while - i just have no words for this! Liked 'your' cover design as much I liked Ray's ones several years back. Yours is a fitting tribute to Ray's extraordinary graphic sense. Wonderful work, Buchun ! Lovely post!...... Loved your design too.... Very cool concept and executed very well. @Kunal Kundu: Thank you so much for the kind words! This is a great blog with some very good articles n unusual content in it. I but the only complaint would be that its not regularly updated. I wud personally love to see more posts atleast once a week. Yashodhara di: No we are not related :) The latest edition of Sandesh does credit me with my full name as 'Shubhojit Ray' (in Bengali) which I believe did create some confusion, and for which I am only slightly embarrassed! Thanks for visiting the blog & commenting. 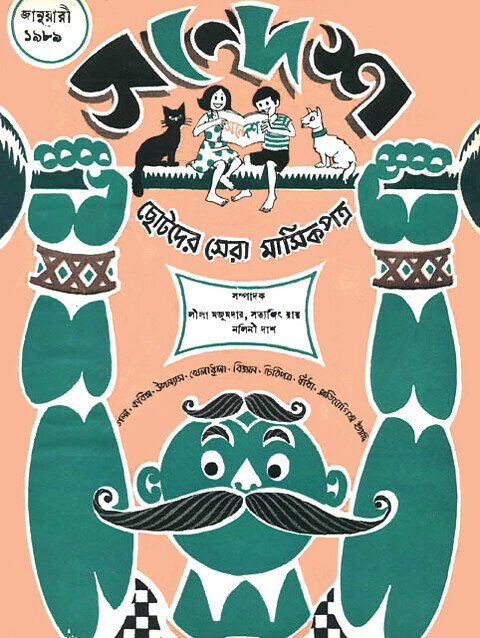 I cannot understand or read bengali but being a design student i cant imagine not being influenced by Ray. I believe he had the most indigenous, culturally rooted design sense and if his work was studied and followed we could've had a purely indian design movement and our own set of modern aesthetics that we lack currently. In that sense, your work here is remarkable. And since the bengali script has no semantic meaning in my eyes, i see your masthead purely as graphic forms, which makes it more intriguing and beautiful. I would really appreciate it if by any chance the magazine could be translated in English or tamil (the two languages i am fluent with)! @Shiva: thank you for kind & thoughtful comment :) I am not sure about the entire body of Sandesh, but surely many of the stories/pieces by the Rays (Upendrakishore, Sukumar & Satyajit) that featured in it have been translated in English. I'll try my best to email you a sketch of a list of these translations, so you can look them up online if you are interested. "it has been translated in English. I'll try my best to email you a sketch of a list of these translations, so you can look them up online if you are interested."